There are a lot of Batmen about, and I don't just mean action figures. No matter what kind of demigodlike spandex-wearing ubermen a superhero verse acquires, there's always some unpowered regular joe mixing it up with the big boys through a combination of quick thinking, gadgets, nebulous martial arts training, and more often than not sheer willpower (or in Tony Stark's case, the kind of chutzpah you get from being three sheets to the wind). Since the Justice League naturally has standing dibs on the actual Batman, the Justice Society makes do - very nicely in fact, despite the silly name - with Mr. Terrific. Michael Holt amassed fourteen doctorates in different disciplines and was a medal winning decathlete. He amassed an early fortune, retired young and had the perfect life until his wife and unborn child died in a car accident. This life-changing event prompted holt to adopt the name Mr. Terrific and use his physical and intellectual skills to fight crime on the street level. He moves on to world-threatening menaces as a member of the Justice Society of America. Despite sounding like a 13-year-old's first attempt at a fanfic superhero, Mr. Terrific is pretty damn formidable - he's got the Batman indomitable-human-spirit thing which means he can last surprisingly well in a fistfight with superhumans, he's the third smartest man on DC Earth (he describes his best talent as "learning," which when you think about it explains why he's so damn smart), and despite being a moral and righteous man, he's also capable of being inscrutably devious when occasion demands. The name's not his fault - when his family died and he was contemplating suicide, he was visited by the Spectre who told him all about the original Mr. Terrific, Terry Sloane, which gave him the inspiration he needed to turn his life around. Mr. T (not that one) has the usual DCU male hero torso and legs, but that's all right because his torso and legs aren't any different to any other male superhero anyway, really. Costumewise he's got what he needs, which is a soft jacket body over the torso, and matching sleeved arms with padded shoulders; a few tiny creases also prove that the hands are indeed sculpted to be gloves, so you can't really say Mattel skipped anything. Depending on the time and artist, small details of Mr. Terrific vary, like the exact pattern of his costume, whether his jacket has a collar, and the addition or not of earpieces, but unless you're a career nitpicker this figure will serve just fine. Although there is one oddity (which I guess all the standard-body figures share): he has no package whatsoever. I'm not kidding, it's just a smooth inward curve from his waist down - I'm not asking for David-Bowie-in-Labyrinth levels of visible detail, but c'mon. All the paintwork is very crisp, which is a must for a figure like this, what with the strongly contrasting black and white blocks, and the equally eye-catching red and white details - any substantial errors would leap right out at you at first glance. The "Fair Play" logos (another inheritance from Sloane) are nice and clean, but the one on the left arm is a bit hindered by articulation - lacking enough room to fit "Play" between the bicep and elbow joints, they've had to put the edge of the "P" on the lower arm piece, so turning the joint will break it up. The freehand "Terrific" on the back of the jacket is likewise clean, but likewise mucked up, this time by the back socket slicing a great big hold through the middle of it. Mr. Terfic's main distinguishing feature (apart from being a black man in comics who's not always shouting) is his T-Mask, a nanite gizmo bonded to his face which renders him undetectable to any form of machinery. If you think that's not a great deal of use, go read up on "OMACs." Since it covers all the key facial features in plain black, it also makes Holt's actual face a bit forgettable, but by the same token if you take a generic handsome, determined-looking black man and paint the mask on him, it looks like Mr. Terrific, which is what Mattel has done. The jacket doesn't impede mobility in any way, so Holt's got the standard set of joints: balljoint neck, swivel/pin shoulders, swivel biceps, pen elbows, swivel wrists, pin sternum, swivel waist, swivel/pin hips, low thigh swivels, pin knees, and pin ankles. It's a good body, and short of the lack of double pins at the elbows and knees, the aforementioned breaking up of the sleeve text is the only shortcoming. Mr. 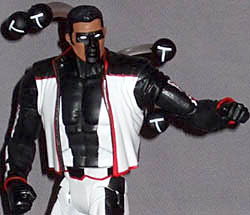 Terrific has one accessory, a clear plastic frame that plugs into his back to give him a quartet of his ever-present T-Spheres, which are little robotic helpers of his own design that do pretty much whatever the writer wants, within reason. 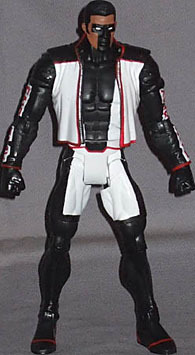 Like his costume, the spheres vary depending on the artist: silver or black, the "T" on each one white or red or red-outline; Mattel's black with plain white "T"s is serviceable, but looks a bit dull. I'm not too fond of the design of the frame either - the two spheres on the right touching (supported by a single rod) looks strange, and the lower left sphere requires the figure's arm to be raised to make room for it. Holt's bit of Giganta is the right leg, and as legs go it's without any real faults. Since Giganta's skirt is included with the torso segment the leg is bare except for the little aerobics weight thingy on the ankle. Articulation is good, but there's an unnecessary low-thigh swivel - the hip has a swivel fulfilling the same function. Overall it's a good figure, apart from the spheres - they irk me a bit. But they can be left off, or if you're obsessive, there's always the option of sawing them off the frame and mounting them on a custom clear plastic or wire support (and repainting the eyes while you're at it). The figure itself is quality, and unless you really want to display him with his back turned to you, can't really be faulted in any serious way.